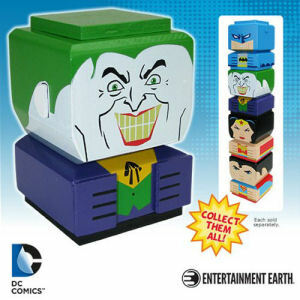 From the Batman collection by Entertainment Earth. The Joker Tiki Tiki Totem. From the Batman collection by Entertainment Earth. The Joker Tiki Tiki Totem. This stackable wooden figure features spectacular 360-degree artwork crafted with hand-painted details and limited decal elements. Tiki totems measure 3 inches tall and are stackable.